Even if they hadn’t been the most prominent—and only action-oriented—puppet shows of their time, Gerry Anderson’s various science fiction “supermarionation” series would have stood out from their film and television peers. While most British and American children’s programming of the era glossed over or completely rejected any Cold War influence, Anderson’s work actively embraced space race technology, espionage, and psychological conflict. Unlike many of his more adult-oriented counterparts, though, the puppet mastermind was incredibly thoughtful and forward-thinking about how he allowed those themes to play out on screen. As admirable as that optimism was, though, it rarely ran more than skin—or, more appropriately in this case, a layer of fiberglass and resin—deep. Anderson, his partner and then-wife Sylvia, and their writers created a future where the West wasn’t constantly on the verge of mutually assured destruction with the Eastern Bloc, but still couldn’t envision a time without similar conflicts along different international or intergalactic lines, nor one without global anxiety, threat of annihilation, or struggles with personal and institutional fallibility and moral relativism. And watching the increasing preoccupation with these themes develop over the course of Anderson’s six full-length sci-fi series from Supercar (which began airing a few months before the Berlin Crisis of 1961) to Joe 90 (which premiered not long after the end of the Prague Spring in 1968) is like watching a generation’s childhood innocence slowly erode and end. Supercar (1961-1962), Anderson’s first self-coined “supermarionation” series to feature science-fiction elements, for ATV and ITC (Anderson had previously developed three puppet programs, including a Western, for Granada Television) is the purest embodiment of his post-war ideal. There is a recurring villain—a Russian one, at that—but Master Spy and his henchman Zarin appear in less than a third of the show’s 39 episode run and provide more comic relief than serious threat as they try and fail to steal jewels, property, and the titular vehicle.The heroes—two scientists, an ace pilot, a helpful boy, and his pet monkey who live and operate Supercar out of a secret base in Black Rock, Nevada—never seem particularly threatened by Master Spy’s mildly nefarious plots, and even show genuine concern for his wellbeing when they strand him in the desert after one mission. But the show’s primary focus was one-off rescue missions in which the Supercar crew, operating as a sort of proto-Thunderbirds outfit, safely conquer petty criminals, natural and mechanical disasters, primate-induced misadventures, and one moderately nerve-wracking nuclear bomb scare. The dangers that the team face are serious, but never insurmountable, and they are always easily won and quipped about by the end of the episode’s 25-minute run time. Fireball XL5 (1962-1963), which also ran for 39 half-hour episodes, continued with a similar tone and a slightly more expanded worldview. This time, the eponymous vehicle and its crew (an ace captain, an engineer, a robot, a beautiful “Space Doctor” with a creepily frozen smile, and her useless, suction cupped-fingered alien pet) belong to the World Space Patrol, an Earth-based organization that operates like a mix of Starfleet and United Nations Peacekeeping. Just as the show’s infectious and chart-topping closing credit theme says, the team flies around the universe in Fireball XL5, way out in space together, assisting in intergalactic diplomacy and rescue missions and saving Earth from the occasional direct threat. Much like Supercar, XL5 also has an ineffective evil duo—the goofy Mr. and Mrs. Space Spy—who appear in a handful of episodes, but it also has some more serious foes. The Subterrains, an abduction-happy alien race from the barren Planet 46, show up in a few episodes to kidnap members of the XL5 crew, engage in mind control, and menace Earth, and the genuinely haunting, disembodied Solars make one memorable appearance in which they temporarily abscond with the moon. The show was still predominantly about singular, simply solved conflicts against a rotating cast of antagonists, though, most of which took place somewhere far away from Earth on one of the crew’s three month-long missions in outer space. Things continue to work out perfectly, except perhaps for when the vaguely Zapp Brannigan-esque Colonel Steve Zodiac inexplicably gets to sing the brilliant closing theme in the series finale. A much bigger shift in tone came with Stingray (1964-1965), the first supermarionation series in color, when a more classically Cold War-style villainous Other emerges in the pilot episode. The Aquaphibians, an underwater warrior society led by the tyrannical King Titan, attack the World Aquanaut Security Patrol submarine, Stingray, and kidnap its Captain Troy Tempest and Lt. Phones. The pair narrowly avoid death when they’re freed at the last minute by Titan’s slave, Marina, who escapes with them to join their organization, and provide a largely disinterested object of affection for the good but clueless Captain. Angered by the loss of Marina, Titan swears revenge, and his continued attacks on WASP’s base in Marineville propels a large portion of the series. Even Stingray’s more whimsical adventures with film crews, jazz bands, and pop idols aren’t free of interference from the king’s mildly competent henchman, the Peter Lorre soundalike Surface Agent X-2-Zero. And while some underwater communities are friendly to the WASP crew, they also manage to encounter a seemingly endless array of underwater pirates, warriors, ne’er-do-wells, and a potential double agent engaging in various forms of aquatic-based mayhem, like threatening to destroy the entire U.S. coast. Throughout the 39 episodes, the battle lines between land and sea are clearly defined, the enemy is always watching, and the target of their aggression is always close to home. Not even Stingray’s hero is immune to the anxiety this causes. Seemingly as unflappable as his Supercar and Fireball predecessors by day, Troy Tempest has multiple nightmares involving stolen radioactive materials and underwater conspiracies against Marineville. Anderson’s most successful and beloved series, Thunderbirds, which ran for two seasons (1965-1966) and two television movies (1966, 1968), returned to Supercar’s catastrophe-of-the-week oriented plots for the majority of its 32 hour-long episode run, but never quite shook the touches of danger and moral complexity that Stingray was beginning to court. While International Rescue, the philanthropical and high tech air, sea, and sky vehicle-operating organization run by the Tracy family, is celebrated for their life-saving efforts all over the world, it is always clear that their efficacy and their very safety depends on their identities remaining unknown. And there is nothing funny about the recurring villain who seeks to discover and sell their secrets. The Hood (as he’s known in related materials and the fandom, although never officially identified on the show), a mysterious figure who lives in a hidden temple in Malaysia and contracts his dark magic and sabotage skills to various enemy governments and other evil entities, is even less caricatured and bumbling than Titan and X-2-Zero. 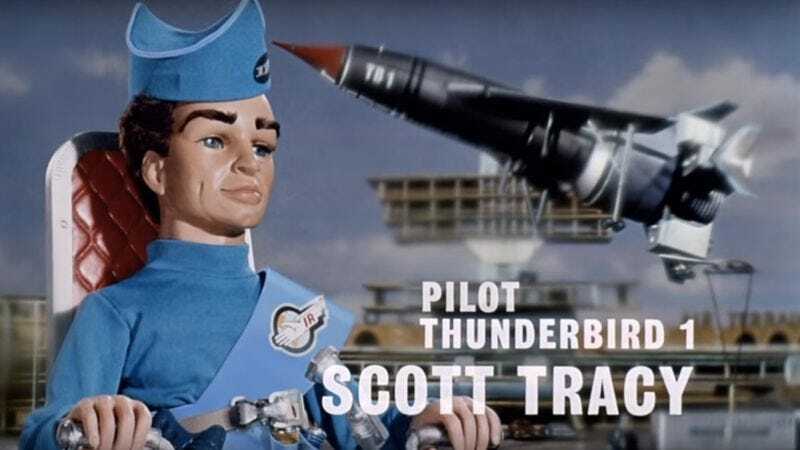 He is always eventually foiled in his attempts to harm the Thunderbirds, both by their superior skill and his own failings, but his efforts consistently pose a serious hazard for the entire IR team. Some of their non-Hood-related missions, including framing plots, stolen classified plans, nuclear testing, and nuclear bomb threats, are even more harrowing, and all too believable for audiences of the time. With Captain Scarlet And The Mysterons (1967-1968), all of the subtext and themes that had been lurking in Anderson’s previous work leapt to the forefront, giving the supermarionation universe its most explicit Cold War series. Unlike previous villains, the Mysterons are both seemingly omnipotent and omnipresent. For 32 straight half-hour episodes, the invisible, regenerating Martian race engages in a self-proclaimed “war of nerves” against Earth, announcing their latest target during the opening credits, and rebuilding and controlling dead human beings to carry out their attacks. The world’s only hope is a global defense organization called Spectrum and their secret weapon, an indestructible (and unsettlingly handsome for a puppet) agent who has managed to overcome Mysteron control: Captain Scarlet. The Mysterons were truly, realistically terrifying—even more creepy than the uncanny valley-esque look of the next generation of hyper realistic marionettes that debuted in this series—an unknowable foreign entity capable of the deepest undercover work that could strike at any time, made all the more alarming by the fact that Spectrum doesn’t always succeed in thwarting their plots. This was a wild departure from the previous supermarionation series. The Supercar crew, World Space Patrol, and WASP never falter against their respective enemies and the Thunderbirds spend less than a couple of seconds fearing they’ve faced their first loss in the episode “30 Minutes After Noon” before realizing that they have in fact saved everyone involved. It was also different from Scarlet’s live-action counterparts. T.H.R.U.S.H. never truly bested the United Network Command For Law And Enforcement on The Man From U.N.C.L.E. and the closest that Star Trek’s Starfleet came to admitting defeat was when Kirk and company were forced to leave warring aliens to fight amongst themselves in “Let That Be Your Last Battlefield.” But Spectrum actually fail to prevent the Mysterons from winning a number of battles in their extended war on nerves, leaving the Earth’s last defense against an infiltrating alien army licking their wounds and trying to learn from their mistakes at the end of multiple episodes. Spectrum were also complicit in their conflict in a way that no other fictional international organization of the time was. Their former agent, Captain Black, instigates the Mysteron war when he mistakenly destroys their settlement during a Martian expedition. “Originally, these shows were designed to be shown to children but we never wrote down to children,” Anderson said in his 2003 interview with Cull. This is particularly evident with Scarlet, a show that acknowledged—if not entirely explored—more about fear of the unknown, moral ambiguity, and the idea that the good guys don’t always win than any of its adult-oriented contemporaries did. If Captain Scarlet officially introduced Cold War anxiety and the ensuing loss of certainty and innocence to the supermarionation text, Anderson’s final full-length puppet show, Joe 90, unintentionally ends up tackling them on a meta level. At some point in the early 21st century, a computer expert named Ian “Mac” McClaine develops a machine (the awkwardly christened Brain Impulse Galvanoscope Record And Transfer, or BIG RAT) that can record a person’s knowledge and experience and transfer it to another human brain. And tests it on his 9-year-old adopted son, Joe. After witnessing a demonstration, family friend and World Intelligence Network agent Sam Loover, a.k.a. “Uncle Sam,” convinces Mac to sign both BIG RAT and Joe up for active duty with WIN. Designated as WIN’s “Most Special Agent,” Joe spends 30 episodes taking on the brain patterns of various experts and engaging in all sorts of high-level espionage. In other words, it was like Dollhouse, but even more twisted and ethically bizarre. Because the brain-wiped operative involved is a 9-year-old boy. From the imaginary coming-of-age games of Harriet The Spy (published in 1964) to the junior secret agent adventures of Spy Kids (2001), kid-friendly espionage has long been a favorite subject of children’s entertainment, a way in which young readers and viewers can picture themselves as part of the predominantly adult spy action that’s been such a large influence in our pop culture for the past 50 years. The character of Joe was intended to offer a similar window into a fantasy world for younger Anderson fans, but the assignments he faced were so dark compared to anything else in the genre, and so often filled with real-world dangers like rogue governments, nuclear bombs, terrorism, and the risk of a world war, that he functioned far better as a symbol of what had happened the generation born into the middle period of the Cold War. Just as Joe was drawn into the thrilling but terrifying world of espionage, his viewers had been pulled into the grown-up realm of arms races and doomsday clocks, a political climate so all-encompassing that its weapons, psychological warfare, and uneasiness had even managed to steadily infiltrate their favorite puppet shows. In the series finale, a clip show called “The Birthday,” Joe turns 10 and celebrates by reminiscing about his best spy adventures with his dad, Uncle Sam, and another WIN agent. The tone is cheery, but the party itself in inherently sad. Joe has no friends his own age, and no one outside of WIN, and his ostensibly fun stories are filled with plane theft and grenade launching. As his BIG RAT overlords sing “Happy Birthday,” the camera zooms in on Joe’s boyish face, impassive because of his emotional state, the limitations of his puppet expressions, or maybe both. He’s still physically young, but the Most Special Agent is hardly a child anymore. He’s seen cool things, learned new tricks, and had fun along the way, but it’s come at a cost. On either side of the screen, there’s no going back.